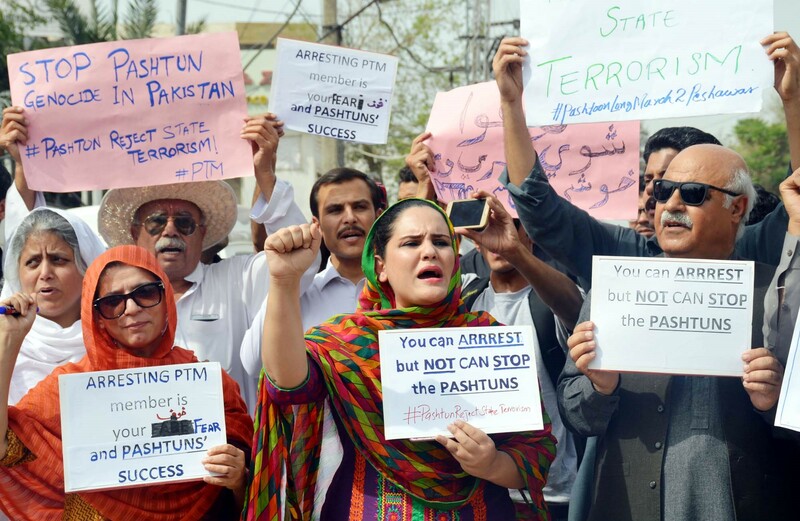 PESHAWAR: Expressing resentment over arrests and registration of cases against its supporters and activists, the Pashtun Tahafuz Movement (PTM) on Monday staged a demonstration in Peshawar. The protest call was given by the political administration of South Waziristan after the arrest of FATA Political Alliance chief Arif Wazir who was arrested alongside Dr Shafique and two others after a rally in Wana on the eve of Pakistan National Day. A large number of PTM supporters and activists along with civil society members assembled in front of Peshawar Press Club. PTM chief Manzoor Pashteen was also present at the Peshawar Press Club but he personally did not participate in the demonstration. The demand of the protestors included early release of arrested individuals, withdrawal of cases, the release of forced detained and missing persons and a stop to the harassment of Pakhtuns on the pretext of war against terrorism. The protesters were addressed by Dr Said Alam Mehsud, Shafique Gigyani, Sana Ijaz, Aurat Foundation Regional chief Shabina Ayaz, Fazal Khan Advocate and Advocate Shahabud din. The speakers showed severe resentment over the arrest of Arif Wazir and others in South Waziristan and termed it not only contradictory to the basic constitutional and human rights but also a violation of the agreement signed between the Pakhtun leadership and the federal government on February 10. Shabina Ayaz who is not Pakhtun by origin stated, “ The non-Pakhtuns have been compelled to support the PTM after seeing their suffering.” She also urged the government to review its policies towards the Pakhun ethnicity. The PTM will also stage a rally in Peshawar on April 8, where as per reports, leaders and office bearers of different political parties will come together to support the PTM rally.